I just got back from an amazing 2 weeks of riding. 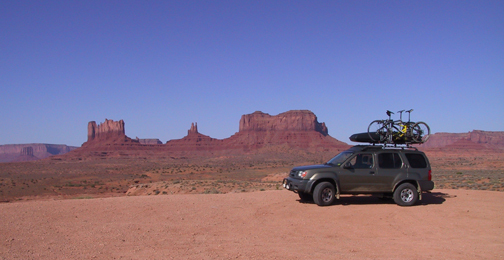 I drove from Austin through the southwest and bagged some of the best singletrack out there. I left on a Friday and drove through to Durango. 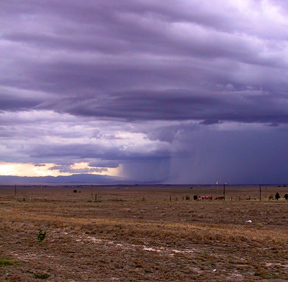 Passed through the plains of northeaster New Mexico and saw some typically wild summer weather. Beautiful storms plying the horizons like men of war at sea. 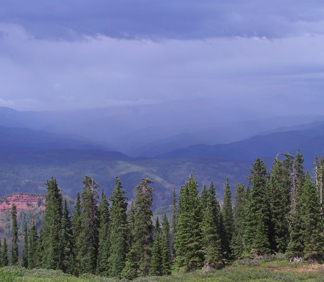 Got into Durango and headed out the next morning to do Kennebec Pass/Colorado Trail. Its a bit of an epic, especially going from 1,000 feet to 11,500 in 24 hours, but it was well worth it. A nice long jeep road climb to settle into, then its singletrack all the way back to DGO. The descent on the Colorado Trail is an all time favorite. Here is a picture from the top. The next day (Sunday) I drove to Zion. On the way I got to see some nice country. 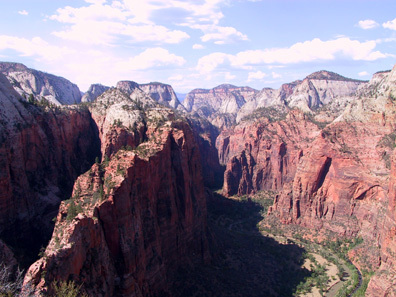 Once in Zion I hiked Angel’s Landing. Everyone should do this hike, the views from the top are indescribable. 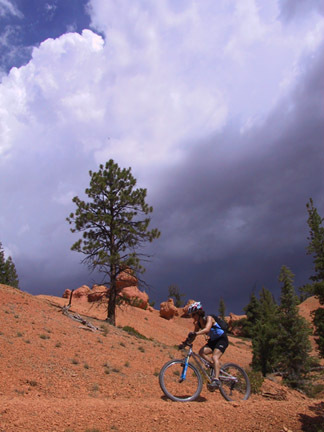 Next came a week in the Brian Head, Utah area with Western Spirit Mountain Bike Adventures. This is an amazing area that is absolutely teeming with great riding. 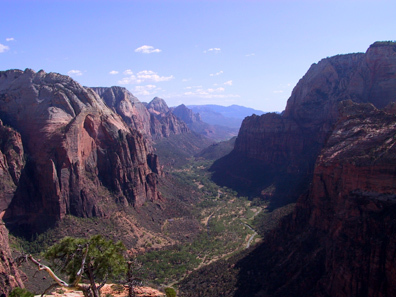 I did the Virgin River Rim trail, which is a 33 mile long all singletrack trail that snakes west to east (or vice versa) at about 9000 feet along the Virgin River Rim, there are many amazing views south overlooking Zion and points beyond. 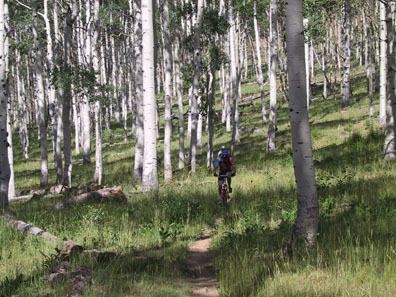 The riding is all through alpine high country, with some stands ofabsolutely huge aspen. 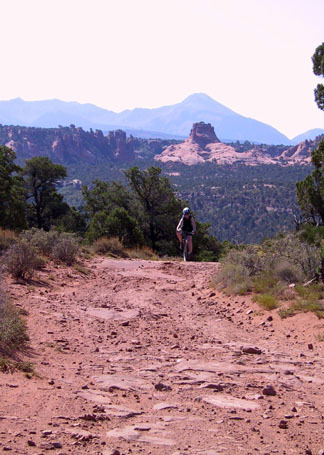 We also did the Navajo Lake Loop, which is a nice 9 mile singletrack adjacent to the Virgin River Rim, it is fun and fast, as as a special treat, at the lower end of the lake there is a lava flow that you ride through, adding a bizarre moonscape quality to part of the ride. 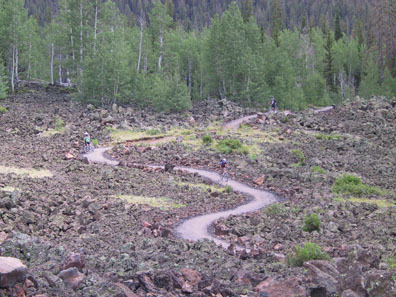 (do NOT, i repat do NOT fall off of your bike in this section, lava will turn you skin into confetti in a hellfire hurry) If you looked carefully, you could find Columbine blooming among the lava. Off of Brian Head peak we did the Scout Camp loop, which has a little bit of everything. 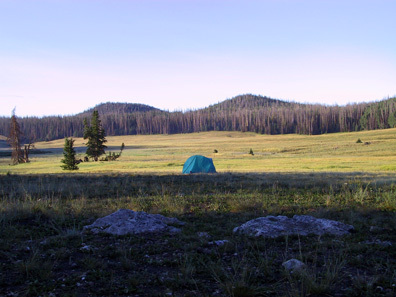 Also we hit the Lowder Ponds trail down to a great campsite, and then the Bunker Creek trail to Panguitch Lake. 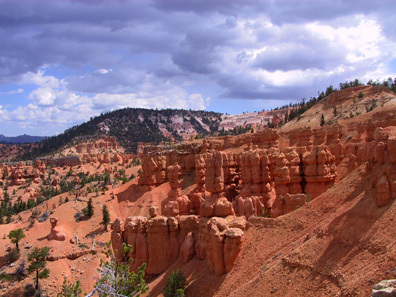 Then it was over to the Bryce Canyon area to do Cassidy trail/Lossee Canyon. A change of scenery here, red rocks breaking through the pine forests. 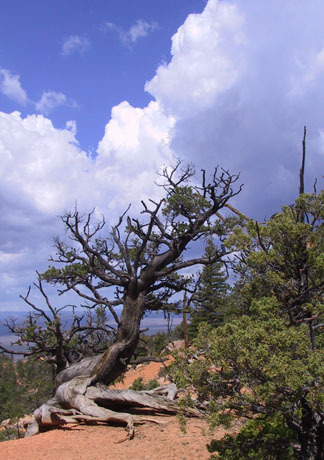 There are even a few bristlecone pine clinging to the edge of the cliffs. And then came Thunder Mountain, which should be on everyone’s life list of “must do rides”. 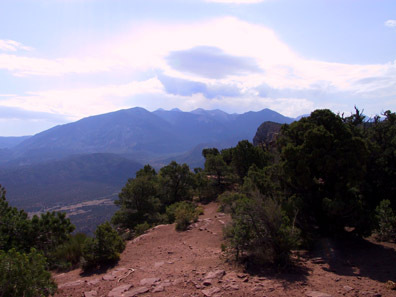 This one starts in pine forests and then drops off of the ridge down into red rock, hoodoo country. 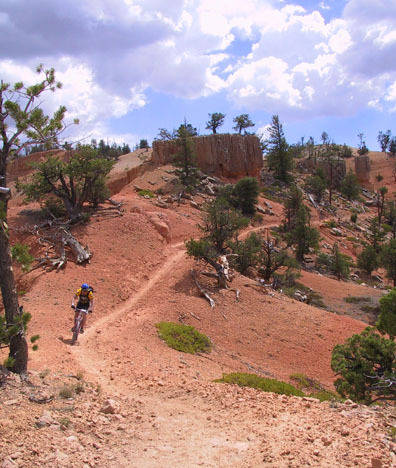 The trail threads through various rock formations, switchbacking down into canyons, climbing back up, darting across precipitous saddles, then the finally is a long, fast, smooth singletrack descent to the valley below. Western Spirit are a class act, the trip was well though out, and the food was fantastic. Among the many great meals we had were salmon steaks, curry chicken, crab dip, and some big honkin' burritos. 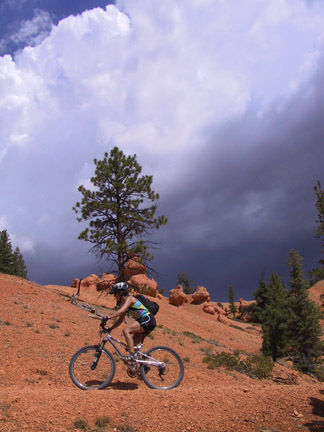 It goes without saying that the guides were good, Petey and Rhonda kept us well fed and singletrack-slap-happy. The rest of the group was a treat too. On group trips like these, you tend to live and die by the overarching nature of the people you are blessed/cursed with for a week, and I have to say it was a pleasure getting to know each and every one of my cohort. Great people and great riders, all. 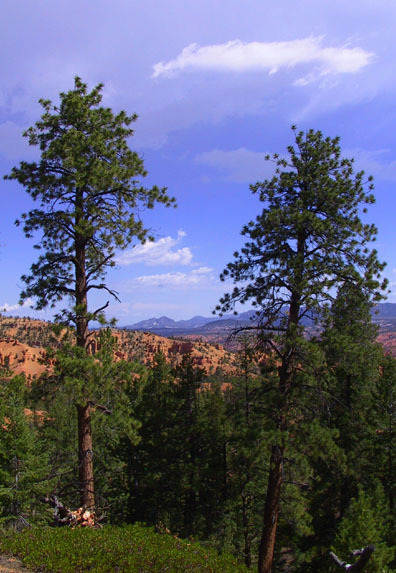 On Friday evening I left the lovely Brian Head area and headed to Moab, met up with some friends and did Porcupine Rim on Saturday morning, leaving early enough in the morning to beat the heat. If you haven’t done this ride, you oughta. Gnarly climbing and some even gnarlier descending, but the view down into Castle Valley from the top is breathtaking. Sunday. Perfect weather. Hermosa Creek. From the bottom. To the top. And then back down. Sweet, sweet riding. Again, this is a ride that should be on everyone’s life list. The more common way to go about this ride is to shuttle to the top and ride down. 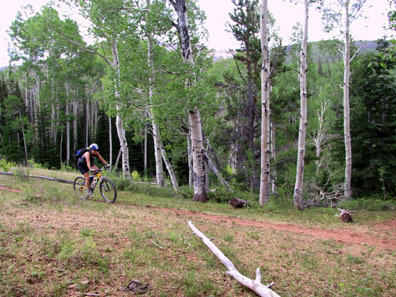 One way is about 21 miles and it is all classic Colorado high country riding through aspen and pine forest. 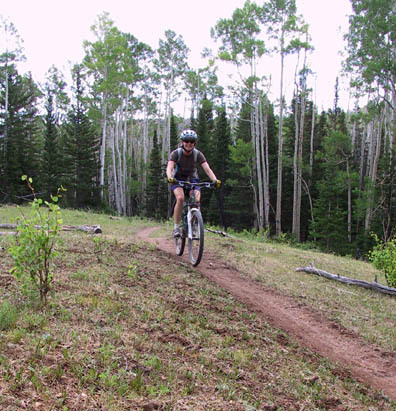 I did a road ride from Durango up to Lemon Reservoir, which took me right through the Missionary Ridge burn area. Much of the area is a sepia tone portrait of black, grey and brown. Mudslides are the new problem, now that there is no vegetation holding down the ground, the summer monsoon has decided to start up, and therein the cure causes the next set of problems for the area. The Durango National rolled into town, so people like Tinker Juarez, Travis Brown, Jimena Florit and Shonny Vanlandingham kept showing up on the trails and in town. I saw Missy Giove’s awesome downhill run that netted her another career victory, unfortunately I also saw Tara Llanes break her collarbone in a crowd-silencing wreck during the warm up for the mountain cross. 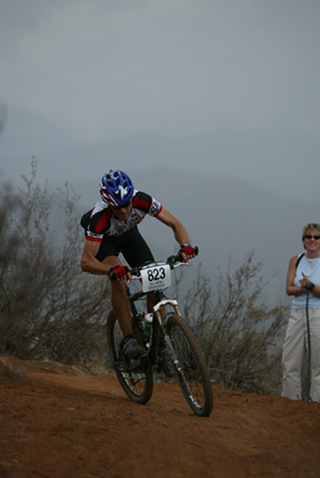 I raced on Saturday, and got 7th place, not too bad considering that I had two solid weeks of riding on my legs.